Sudhir Chowdhary : The world of IT is evolving once again. After only a few short years, cloud computing is poised to cross the line from technical curiosity to a viable resource for many modern IT infrastructures. Cloud momentum is entering mainstream in the R2,000-crore Indian online retail space because it offers new economy firms significant benefits. These include lower operating costs, increased scalability, faster implementation, and better engagement between IT and the business. All are benefits any CIO would welcome. Cloud computing represents a broad array of Web-based services aimed at allowing users to obtain a wide range of functional capabilities on a ‘pay-as-you-go’ basis that previously required tremendous hardware/software investments and professional skills to acquire. The earliest adopters are technically oriented start-ups. Naturally, they need to adapt to survive and change constantly with the moving times. Recently, more than 4,000 employees of IndiaMART.com, located across 75 offices within the country started using Google Apps for Business as their primary messaging and collaboration suite. Google Apps is a suite of communication and collaboration applications including email, instant messaging, calendaring, documents, spreadsheet, presentations, drawings, websites, video sharing and more. With Google Apps, email, spreadsheets, calendars and presentations suddenly become accessible quickly and securely wherever you are. Everything is online means that multiple users can access and work on documents simultaneously and edit in real-time. In short, no more emailing backwards and forwards with attachments. IndiaMART is one of India’s leading online business-to-business (B2B) marketplace for small and medium size businesses, connecting global buyers with suppliers. The migration to cloud has allowed IndiaMART to move its employees onto one common email platform. IndiaMART is in the process of rolling out collaboration tools such as Google Docs, which allow employees to share files and collaborate in real-time, keeping versions organised and available wherever and whenever they work. The company also has its attendance and payroll systems on the cloud. IndiaMART has always been proactive in adopting new technologies for seamless business operations. It is this outlook that prompted them to utilise Google Apps, which promises better infrastructure and management than what is ordinarily possible with on-premise solutions, while serving millions of users simultaneously. “With the wonderful suite of applications that Google has created, that tend to help organisations save time, money and resources, we are optimistic that these innovative apps would definitely trigger many organisations like us to move on to cloud,” he adds. “We are a click and mortar multi-channel retailer. Cloud is a part of our story too,” asserts Arun Gupta, Group chief technology officer at Shoppers Stop. Mumbai-based retailer Shoppers Stop is running most of its systems on the cloud. “The cloud solution has been deployed for e-commerce foray of the department store and the bookstores, viz. shoppersstop.com and crossword.in respectively. We have taken a multi-vendor strategy for our cloud deployment based on the evaluation criteria in which the fit to business need was paramount. The vendors offered comprehensive solutions for e-commerce which we believed will help us with quicker deployments while removing the technology complexity and its management from the IT team. It allows us to scale as the business grows,” he says. The market size of online retail industry in India is likely to touch R7,000 crore by 2015 due to increasing internet penetration across the country. Retailers today are working to do more with less. And for retailers seeking to get big results with minimal resources, cloud computing is beginning to look like a miracle. So, what’s pulling retailers toward the cloud? “It’s the ability of cloud computing to address three key challenges for retailers: focusing on core competencies, meeting unpredictable demands and improving customer service,” says Mekin Maheshwari, president (engineering) at Flipkart.com. “Cloud computing enables retailers to focus their resources on the things that set them apart: Store portals, social media, digital marketing and employee retention. It lets them invest less in maintaining, monitoring and updating shared working documents, e-mail and, operational data. 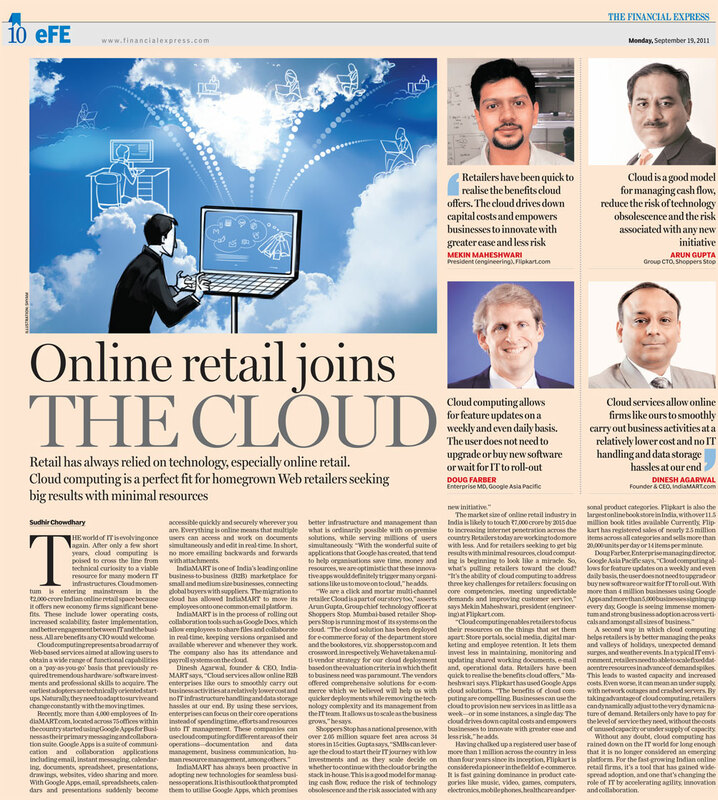 Retailers have been quick to realise the benefits cloud offers,” Maheshwari says. Flipkart has used Google Apps cloud solutions. “The benefits of cloud computing are compelling. Businesses can use the cloud to provision new services in as little as a week—or in some instances, a single day. The cloud drives down capital costs and empowers businesses to innovate with greater ease and less risk,” he adds. Having chalked up a registered user base of more than 1 million across the country in less than four years since its inception, Flipkart is considered a pioneer in the field of e-commerce. It is fast gaining dominance in product categories like music, video, games, computers, electronics, mobile phones, healthcare and personal product categories. Flipkart is also the largest online book store in India, with over 11.5 million book titles available Currently, Flipkart has registered sales of nearly 2.5 million items across all categories and sells more than 20,000 units per day or 14 items per minute. A second way in which cloud computing helps retailers is by better managing the peaks and valleys of holidays, unexpected demand surges, and weather events. In a typical IT environment, retailers need to able to scale fixed datacentre resources in advance of demand spikes. This leads to wasted capacity and increased costs. Even worse, it can mean an under supply, with network outages and crashed servers. By taking advantage of cloud computing, retailers can dynamically adjust to the very dynamic nature of demand. Retailers only have to pay for the level of service they need, without the costs of unused capacity or under supply of capacity. Without any doubt, cloud computing has rained down on the IT world for long enough that it is no longer considered an emerging platform. For the fast-growing Indian online retail firms, it’s a tool that has gained widespread adoption, and one that’s changing the role of IT by accelerating agility, innovation and collaboration.